The Coronation quilt block is a good choice if you are interested in making a large block for your quilt. The choice to make a larger block is sometimes due to the number of pieces in the block, so it is easier to be accurate in your sewing. I have created instructions for both a 16" block as well as the more common 12" block. The patches are simple -- there are just more of them. The block features half square triangles and flying geese units. The final block is really a block within a block as the centre patch is a block all on its own. 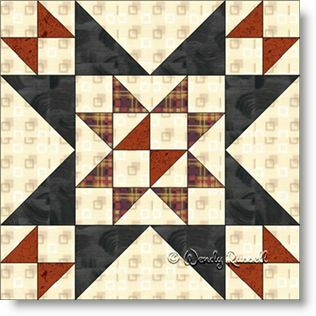 The sample quilts illustrated use a straight setting (which produces a secondary pattern in your quilt - look for the additional small stars created when blocks are side by side) as well as an on point setting with sashing and blank blocks.